I decided to embark on the wonderful challenge of making vegan crème brulée. This has always been one of my favorite desserts, but I never considered trying to make a vegan version myself. I wanted to try to use a cashew base instead of relying on tofu, as I find that often desserts that have a subtle flavor and a good deal of tofu can some times be too plain. After mixing my first batch, I tested the uncooked custard before it went in the oven and it had a very strong cashew flavor. Since I had extra of all the ingredients, I thought it would be best to try another batch with a different recipe, to make a less intense version. Here are the results and recipes to go along with them. The process for each version is nearly the same, version 2 just has to cook a little longer. 1. Preheat oven to 325° Place your dishes on a cookie pan. Depending on your dishes, this will make 4-6 servings. 2. In a food processor, blend the tofu until it is smooth. While the processor is still running, add the sugar and let blend until smooth before adding the cashews and soy creamer together. Blend until there are no chunks, this should take a few minutes. Finally, add the cornstarch, vanilla and lemon, blending until everything is combined. 3. 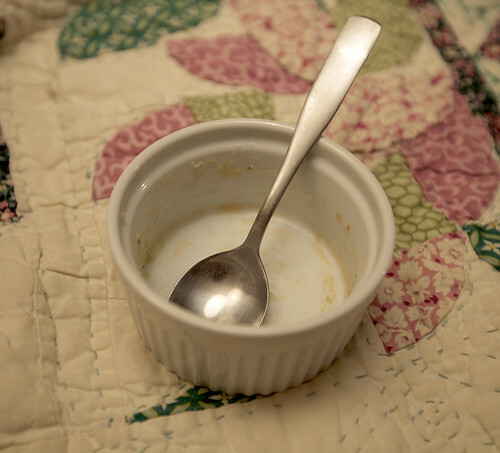 Pour the custard into your dishes and place in the oven. Cook for 15-20 mins for version 1 and 25-30 for version 2. The outsides will be slightly firm and centers still slightly soft. 4. Let cool to room temperature and then place in refrigerator. Refrigerate for approximately 2 hours or until cold. 5. Sprinkle with sugar, enough to make a thin layer over the top of the custard. Use a butane torch to caramelize the sugar. If you don’t have a torch, you can try putting them under the broiler for a few minutes. I was impressed at how good these were. Both have a strong cashew flavor, but it isn’t overwhelming. I believe this is mostly due to the flavor of the Mimicreme which is also made from cashews/almonds. I think next time I’d like to use a generic soy creamer to make it a bit lighter. Version 1 was much denser. The flavor was smoothed out when it baked and was very pleasing and rich. Version 2 was lighter and creamier but wasn’t quite as custard like. Back to back, they didn’t have major flavor differences, they did have the same ingredients after all, it was mostly just a difference of consistency and intensity. I have only had one vegan crème brulée ever, which was amazing, so I know that a fantastic vegan version is possible. These were really good (I’ve eaten 3 already!) but I know they could be even better. This is one experiment I won’t mind repeating. omg this is so happening! Creme Brulee is one of those things I really miss. Great recipe! I have been interested in finding a good one-thanks for posting it. You deserve a giant vegan prize for this! GENIUS! I can’t believe how beautiful these look, and you are kind enough to share with us 2 recipes! THANK YOU! How beautiful! I never really liked crème brulée because of the strong egg flavour. Now this sounds perfect for me. don’t you love it when traditional recipes get way better when they’re veganized? I’ve never had creme brulee and thought the experience was just lost to me as a vegan. Thanks for the recipe! Wow that looks amazing! I meant to experiment with Creme Brulee, but didn’t know where to start. Yours definitely looks delicious. I’m going to have to give it a try. Yes! I LOVED creme brulee, and I can’t wait to try these recipes. Your experiments make me happy! Hell YEAH! Creme Brulee is super delicious and I’ve never had a vegan version. the creme brulee at madelines is insanely good. i aspire to make some that tasty…working on it…. OMG I must try this! I love Creme Brulee! how cool! 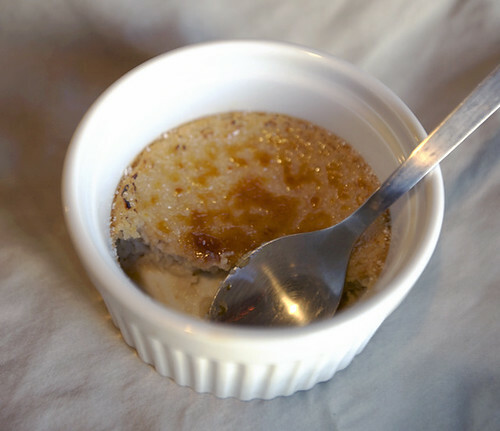 veganized creme brulee is such a great idea- I can’t wait to try this! I’ve never had creme brulee before, but yours looks really delicious! Thanks for this info. 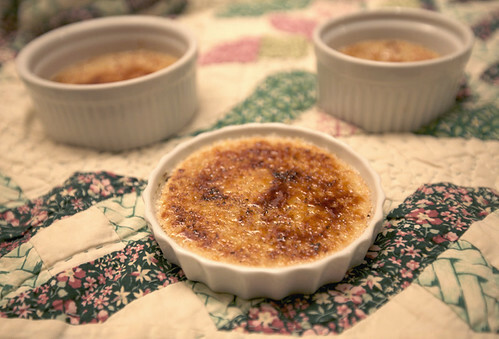 I’ve never had creme brulee, but my husband loves it and I’d really like to be able to make a vegan version at home. At mexican restaurants it always comes with cinnamon on top, I bet that would be good here. I’m putting this recipe on my to-do list, and if I play around with it, I’ll let you know how it goes! Also, your kitties are completely adorable! please do let me know how your experiments go! i still want to try a few more things on this even though it was tasty. also, my kitties purr thank you. i was just thinking they need to make an appearance on the blog since they’ve grown so much since that photo was taken.